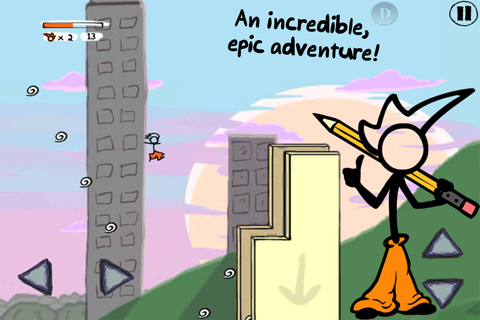 Fancy Pants Adventures is the latest iOS game release from Chillingo. For this review Fancy Pants ran smoothly on my iPhone 4S, although the app is designed to run on the iPad and iPod Touch as well. You can’t download this app over 3G since it is over 50MB but it’s worth grabbing it when you get a chance. The concept in Fancy Pants Adventures is this. You’re controlling the eponymous stick-figure character, who only wears a set of fancy pants (orange to start, but the color is customizable). 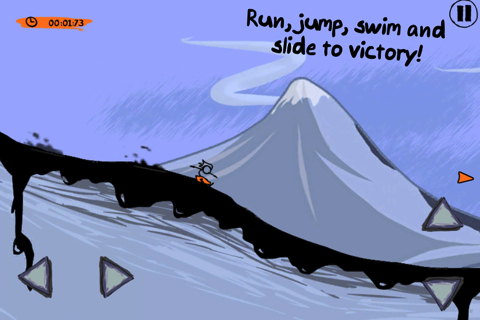 The deceptively simple doodle art and two-dimensional side-scrolling action mask an exciting and entertaining gaming experience. 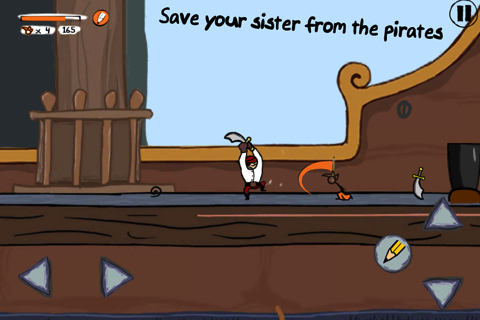 The game controls are simple, a left-right arrow keys for your left thumb and up-down arrow keys for your right thumb. However while playing I quickly learned to do combos that let me perform some amazing wall-to-wall leaps and flips. In short order (and with the help of the tutorial) I had my little guy jumping around like Jackie Chan. Your character can also do a “power slide” which is ridiculously fun once you get the hang of it. It was relatively simple to master however, and within just a few minutes I was performing some exhilarating zooming skids around the game board and knocking enemies out of my path. Fancy Pants has a kickin’ soundtrack, and the soulful music provided the perfect audio background as I learned the controls and really started enjoying the gameplay. Ok time to nitpick. One downside to the application is the size. 268 megabytes! For a game with intentionally made simple graphics, this is a ridiculous amount of precious storage space to surrender on my iPhone. But really its universal so they are probably storing a large version of each image for the iPad version. Chillingo has produced a great game, and now they should direct their time to find a more efficient way to code or package this for the iTunes store. Great for a first version, but I’m confident that the same application could be recoded to be much smaller; since there are no videos, no images with photorealistic resolution, and very little audio. The doodle art backgrounds should not have to take up this much space. If you have a lot of free room on your iPhone, iPad, or iPod Touch or simply don’t care about that fact; then you can’t go wrong by downloading this game and spending at least the next few hours completely immersed while enjoying this new title from Chillingo. Fancy Pants is an amazing value at only $0.99 and I definitely recommend that you give it a try yourself, or buy it as an affordable present for somebody that you love who loves games. 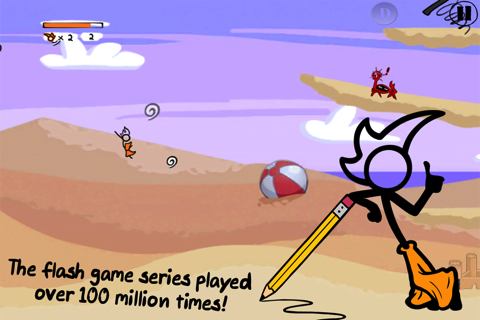 AppSafari review of Fancy Pants Adventures was written by Joe Seifi on March 21st, 2012 and categorized under Action, Adventure, App Store, Games, iPad apps, Scrolling Shooter, Universal. Page viewed 9882 times, 8 so far today. Need help on using these apps? Please read the Help Page. Please help me. Anyhow the game is great please respond. It’s a good game but I expected more. Great article, I really liked it. Thanks for the content, keep posting more.